Before coming to Thailand, I had the impression people from Southeast Asia were soft-spoken people with the need for peace and quiet in their daily lives. Thais don’t seem comfortable in silence. If there’s no noise, they just talk about rice, hot weather or if I have a girlfriend. Here are a few more examples. Thais hate an awkward silence and talk constantly, even when there’s no need. Many can’t seem to count or read in their head. My friend Emily once told me her phone (bought in Thailand) has a Meeting setting, but it does not silence the ringer. Thais love to crank their ringers and ring tones to top volume and rarely are they near their phone when it rings. When calling someone else, Thais rarely give up after four or five rings. It’s usually a full 60 seconds before they give up. Then they call back … 15 seconds later … and let it ring for another 60 seconds. Thais advertise the same way the Blues Brothers did for their big show: shouting through a megaphone attached to the top of their truck. They cruise through villages and big cities alike, blaring music and shouting about who to vote for in the next election or the flat-screen TV that’s on sale at the electronics store downtown. Funerals last five days and they might stop the music at midnight. If they do, they resume at sunrise. Funerals are held at the home of the deceased. There’s no sympathy for neighbors. Weddings and monk ordinations don’t look or sound much different to the untrained eye. Sadly, it’s not much different in the states. There’s always some late teen cranking horrible bass-booming music from his truck for everyone to hear in order to make up for his self-esteem issues. “It’s five o’clock somewhere” would not make sense to a Thai as they don’t look for an excuse to drink other than if they’re still alive. As early as 6 a.m. I’ve seen men downing their Lao Kao (rice whiskey) while shouting inappropriate English phrases at me (“I love you!” “Where you go?” “My friend!”) while doing their best to ignore their wives. Thais don’t mind when their dog is barking endlessly. Nothing irritates these people. A racing, growling dog chasing a passing bike is treated with curiosity. Huh, I think I’ll study the habits of my dog instead of getting him away from the frightened white person. One of my goals before going home is to kill a rooster … with my baseball bat. I would not feel remorse after the sweet spot of my bat wraps around a rooster’s neck after a full Ted Williams swing. Roosters make the most obnoxious and testosterone-filled noise in the history of the world. There’s good reason they’re restricted to farms in America. They’ve learned not to crow near the front of my house. Like a bored farm boy tipping cows for fun in a rural Iowa town, I throw rocks at roosters for kicks when I’m home. I’m not proud of this, but one of my biggest pet peeves is the sound of someone eating with their mouth open. I go out of my way to make sure my lips are sealed when I’m eating. It’s not a difficult task and I don’t see why the entire world can’t do the same. About five percent of Thais are capable. They eat with mouth wide between every bite and once everything is grounded to a swallowable size, they smack their lips and tongue like a basset hound eating a peanut butter sandwich. There’s no muffler laws in Thailand. The same kids with self-esteem issues who blast music from their trucks also have the loudest motorcycles on the road. They fly down the road without the slightest apology in their faces. This one can’t really be helped and I don’t mind it, but Thai homes don’t need insulation, therefore when it rains, it sounds like you’re inside a pole barn. It’s loud and talking to someone on the phone is not possible with heavy rainfall. One of the few loud noises in Thailand I enjoy: rain. Long bus rides can be tolerable when I have a good book and my iPod, but both are cancelled out with a movie or television show on the bus TV. It’s rarely at a reasonable volume where only the people on the bus can hear it and not the farmer in the field we’re passing 50 meters away. If there’s not a TV, many times there will be music. For this reason, I’m always sure my iPod has plenty of Green Day to drown out the Thai tunes (the album Insomniac works best). Ah, but one year from now I’ll be starting a new job or graduate school and have bills to pay and many responsibilities and I’ll be wishing I was waking up at 6 a.m. to roosters, barking dogs and obnoxious Thai men because that would mean I’m still a Peace Corps Volunteer, the coolest job on the planet. 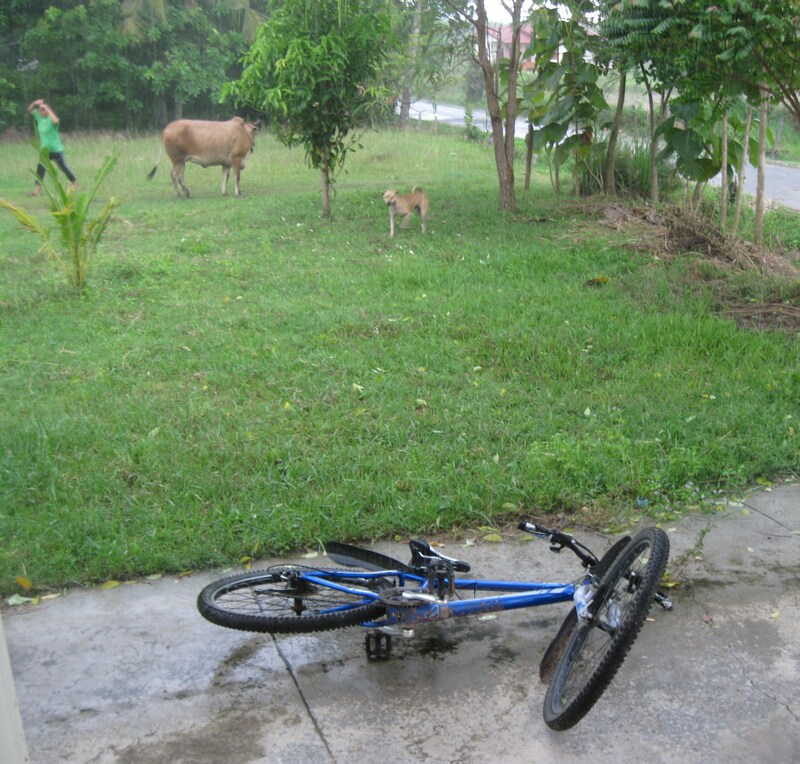 This entry was posted in Peace Corps and tagged cell phones, noise, peace corps, thailand by Jeff Jackson. Bookmark the permalink. Darned right it’s the coolest job on the planet! I was a Peace Corps English Teacher in Phatalung 40 years ago and it changed my life forever.